Breathtakingly beautiful old mine cut Diamond ring from the Art Deco era, showcasing all the classic touches of that era. Clean simple lines allows the sparkling Diamond to remain the center of attention. The Diamond is gorgeous with chunky facets, bright face up with wonderful light play as the Diamond moves,exceptional sparkle and radiance. The Diamond is in a classic secure set eight prong setting and weighs 1.52 carats. There are a further six Diamonds on the shoulders for that added extra sparkle. This old mine cut Diamond unique, or put poetically, have its own personality. The Diamond ornamented shoulders are integrated into the Platinum shank. The Diamonds sparkle and glisten continuously captivating the allure of natures beauty. The whiteness and luster of Platinum enhances the colour of the sparkling Diamonds. The very essence of sophistication a magnificent piece of the highest quality. Having a Diamond Art Deco ring on your finger is truly a one of a kind piece to be treasured for a lifetime. 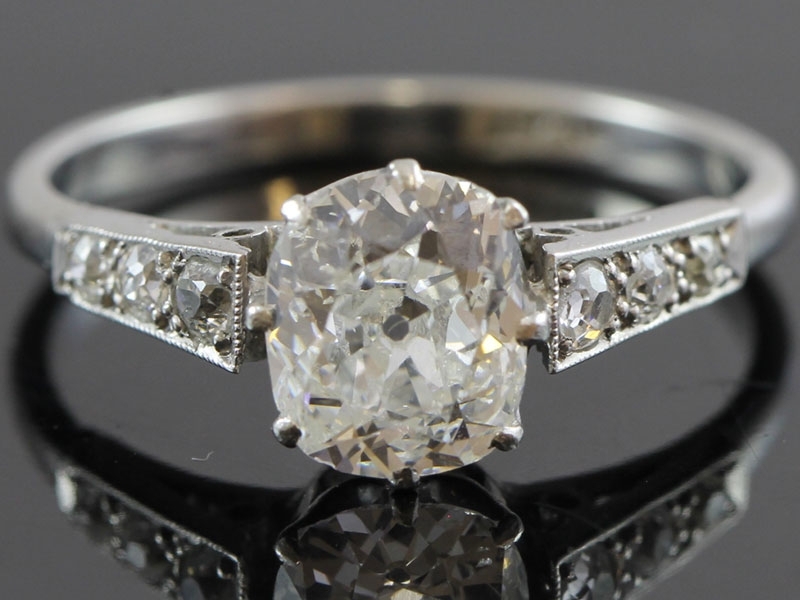 This ring is sure to become a treasured family heirloom and would make a stunning engagement ring. For centuries Diamonds have been a symbol of love, excellence and purity. Because of its unmatched hardness and clarity, it also symbolises power, strength, brilliance and unparalleled beauty.